This Feast is a liturgical event celebrated every year on January 6th according to Gregorian calendar (January 19th Julian calendar), and is also known as the Twelfth Day of Christmas. Over the centuries, it has evolved into celebration of the baptism of Jesus by St. John in the Jordan River more than 2000 years ago. During Theophany, Christians traditionally attend a prayer service where the priest blesses water in the Great Jordan Water Blessing. Years ago it was customary to go to the nearest river where the waters would be blessed. When the ceremony took place outdoors on a river or lake, an ice cross was cut out from the ice for the event. After the ceremony, the faithful would take the Holy Water to bless home, to drink as remedy for spiritual and bodily wellness. During Theophany, clergy visit parishioners with Holy Water and bless them and their homes to purify them and provide grace for body and soul. The Holy Water is also used to bless candles for the Encounter of Our Lord, palms on Palm Sunday, Paschal eggs and Easter baskets for Easter, liturgical vessels, and also used for baptisms. Holy Water found in fonts at the entrances of the church is used with the sign of the cross, for renewal of baptismal vows. 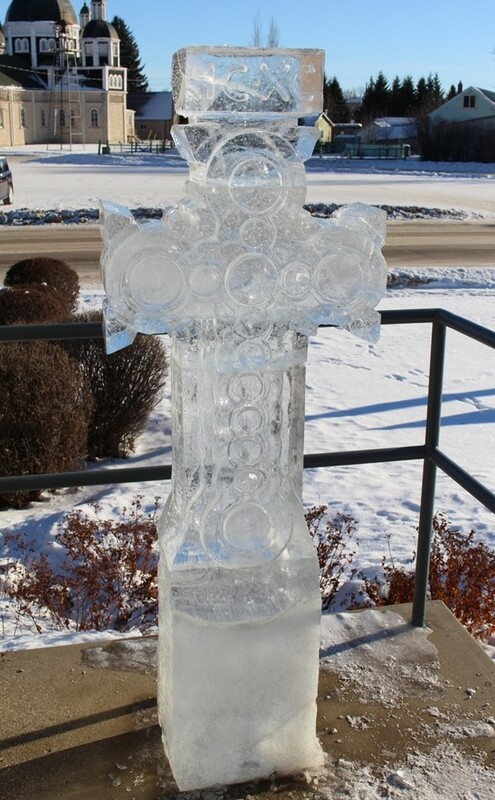 This most exquisite Ice Cross was sculpted for our Parish by Jason and Michele Gulenchin of Dauphin. Unfortunately it was destroyed by vandals two days after it was erected.